Finisher food bag filled with tasty and nutritious refueling foods at the finish line including TruMoo Chocolate Milk! IMPORTANT: Please note that the only way to access the start line is via an event-supplied shuttle. There are no participant drop offs allowed at or near the start line and vehicles, pedestrians or bicycles will not be allowed past Electron Drive, located more than 2 miles from the start line. If you miss the last bus to the start line, you will not be able to run the half marathon. The half marathon and 5K finish in Balboa Park. This is also where the half marathon start line shuttle pickup takes place as well as the post-race Finish Line Festival. You may park in any legal parking lot in Balboa Park. The largest parking lot is the Zoo parking lot adjacent to the northern bus loading area. Allow yourself at least an extra 30 minutes for parking. The America’s Finest City Half Marathon & 5K requires the help of 1,000 enthusiastic and hard-working volunteers to make it happen. Volunteers provide key support to over 6,000 participants as they reach their goal of completing the half marathon or 5K. No experience is necessary to volunteer and there is a wide variety of fun and exciting job choices available. Volunteers have the opportunity to meet people from around the country and get a behind the scenes view of this major community event. All volunteers receive an official Race Crew T-shirt and the appreciation of thousands of participants who benefit from their support. Head to the official event website for more info. Will medical services be available on the course? Medical assistance will be available at the start and at the finish. Race Guards trained in CPR and first aid will also be out on the course. Runners observing others with possible medical difficulties along the route should alert the nearest police officer, race official, aid station or call 911. There will be one medical tent in the secure, fenced-in finish chute (just beyond the finish line) and one medical tent and a self-serve ice tent in the post-race Finish Line Festival. Yes, there is a strict 3-hour time limit (13:44-minute-per-mile pace) for the half marathon. 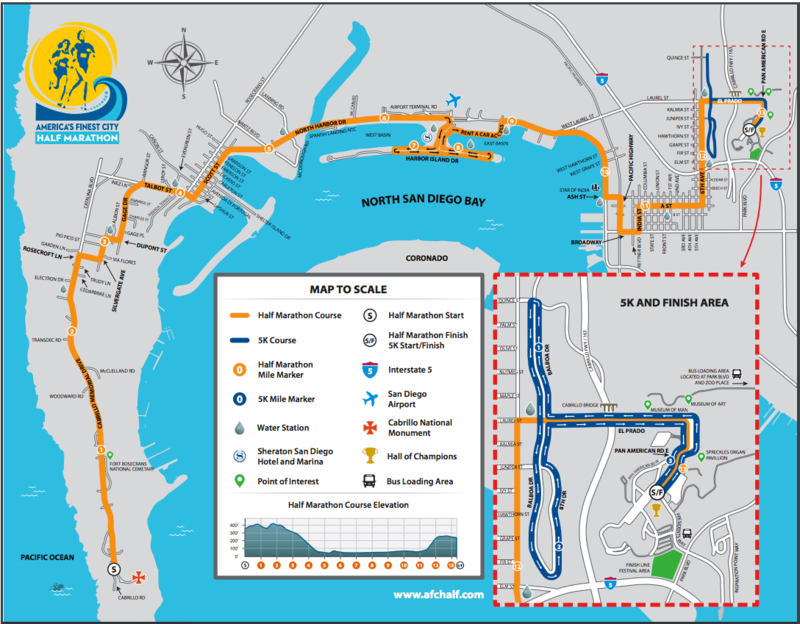 Participants who do not reach North Harbor Drive and Harbor Island Drive (6.3 miles) by 90 minutes after the race starts, will not be permitted to do the Harbor Island section of the course (approximately 2 miles) and will instead be directed to continue on the route to the finish line. There is a 1-hour time limit for finishing the 5K. All participants must be able to maintain a 19:21-minute-mile pace or faster throughout the event. Both the half marathon and 5K time limits are based on chip time, meaning the time limit countdown begins the moment the participant’s timing chip passes over the start line timing mat. The time limit is necessary to ensure the safety of all participants as the public roadways must be opened to normal traffic at specified times and closed to participants. Participants exceeding the time limit pace may be asked by race staff or San Diego Police Department personnel to take a shuttle van to the finish. PLEASE DO NOT ENTER THE HALF MARATHON OR THE 5K IF YOU DO NOT EXPECT TO FINISH WITHIN THE TIME LIMITS. How do I get my bib number, timing tag and race shirt? All participants must pick up their bib number with timing tag attached and race shirt at the expo on the Saturday prior to race day. They will not be mailed. At the expo, you’ll first pick up your bib number (you must have your photo ID) and will then use your bib number to pick up your race shirt and reusable shopping bag. While we do all we can to ensure you receive the shirt size you request, we cannot make any guarantees. IMPORTANT: If you’re unable to attend the expo or send someone in your place to pick up your bib number and race shirt, be sure to select the Race Day Pickup option and pay the additional $20 convenience fee when you register. If you’ve already registered and want to add the Race Day Pickup, you can log in to Events.com and add it to your registration. If you do not already have an Events.com account, you will need to create one using these easy instructions. Anyone attempting to pick up their bib number on race day who hasn’t paid the $20 fee will be required to pay onsite (cash or credit card accepted). Can I pick up my bib number on race morning? Half Marathon: If you’re unable to attend the AFC Fitness Expo and need to pick up your bib number on race day, select the “Race Day Bib Number Pickup Convenience” option during your registration ($20). Your bib number will be available for pickup at the southwest corner of Park Boulevard and Presidents Way in the middle of the Finish Line Festival area on race morning starting at 4:00 AM. There is no mailing of bibs. Anyone attempting to pick up their bib number on race day who hasn’t paid the $20 fee will be required to pay onsite (cash or credit card accepted). Race shirts will be available for pickup at the Finish Line Festival after the race. What amenities are offered on the half marathon? Water will be served at support stations located approximately every mile starting at mile 2. Ultima Replenisher will also be served at miles 4, 5, 8, 10 and 12. Portable toilets will be located at each of the above support stations. Course support will remain in place based on a 3-hour finish pace. How was America's Finest City Half Marathon & 5K?